Do you believe in the adage that says "First impression is the last impression"? I find this proverb quite impractical to follow in real life because human mind is constituted of variegated kaleidoscope of complexities and one's actions are regulated by a dozen of factors. For example, suppose you had a fight with your spouse at home and your mood is overpowered by a sudden rise in hormonal change, very common to women during a monthly cycle. If someone meets you for the first time when you are in worst frame of mind and you behave not in your best self, the first impression formed by that person will be absolutely wrong about you. You might be an easy-going cheerful person but you cannot remain in your best spirit always. C'mon. We are all human beings at the end. However, despite your second and third meeting, if you find a person disagreeable and not suiting to your nature, then I believe you should come to a conclusion that we all are different and not everyone is made for everyone. In that case, both of you may choose to go on your individual ways. If suppose, you find someone extremely distasteful in nature and completely opposite to you every way so much so that even tolerating that person's very presence becomes a pain, but you are in an unavoidable circumstance where in spite of your hating the person from the bottom of your heart, you do need to see his/her face every day and even talk to him/her politely and amicably so as to maintain peace at 'work'. Yes, at 'work'. In personal life, sometimes, we may avoid the person we hate or we don't like but in professional life, doing that very thing becomes a hell of a difficult task. Anyone having been through such an experience knows about the stress I am talking about. Back to the recipe, vegetable dal or sabji dal is a flexible dish that can be concocted with seasonal vegetables. The selection of vegetables to be used in cooking this dal is up to your discretion. I used what I my palate desired at that moment. 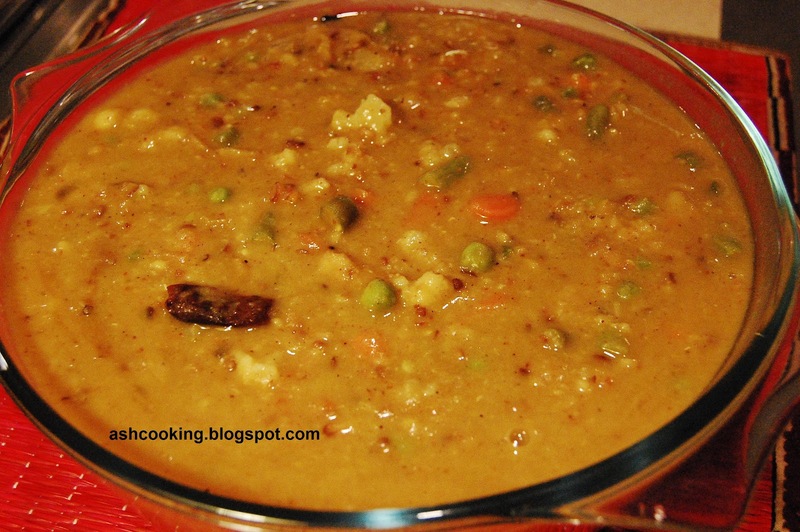 1) In a piping hot tawa or non-stick skillet, dry roast the moong dal. Unless done properly, this can spoil the taste of your entire dish. So the best way to dry roast moong lentils is to heat the skillet and then add the lentils. Continuously keep stirring else the dal might get over roasted and darkish brown. In that case it would taste bitter. Just as you complete dry roasting and the hue of the lentil changes to golden brown, wash the lentils properly under running water, again and again. 2) Now in a pressure cooker, add moong lentil along with masoor dal. Add water, butter, turmeric and red chilli powder. Give a gentle stir and lock the lid onto the pressure cooker. Give 1 whistle. 3) Heat oil in a wok and when oil turns smoking hot, add cumin seeds and dry red chillies and allow them to sputter. 4) Then add the vegetables one after another and shallow fry. Cover the wok with a lid, if possible, to let the vegetables be cooked in the steam that builds up inside. 6) Fold ginger paste into the dal and sprinkle garam masala powder on top. Give a gentle stir to help the ingredients distribute proportionately. 7) In a skillet, brown the onions and then mix them with the dal. 8) Serve hot with rice or roti. Note: If you want the dal to be rich in taste, you may drizzle a tsp of ghee at the end.